d4f - "your work is alway's brilliant - even though, i was unable to get this skin to work - i have never had any issues with your skins - is there a special setting to be use on this one - pls advise, thank's !!" Hi, thx for your comment, no with skin are nothing special settings, l also download and test again working fine. you shell have classicpro pluging 1.15 added? d4f - "i'm running "winamp 5.57 version" - i can in most cases run either classic or cPro skins - where in "preferrences" might i find "classicpro plugin 1.15" ?? if i don't have this plugin, i have already located where to download/install - eventhough "winamp" is great - it's not easy looking through all the plugins unless even if you have the specific name - is odd - but, will keep trying to find the appropriate solution - thank's a million for going the extra mile for me - is greatly appreciated." 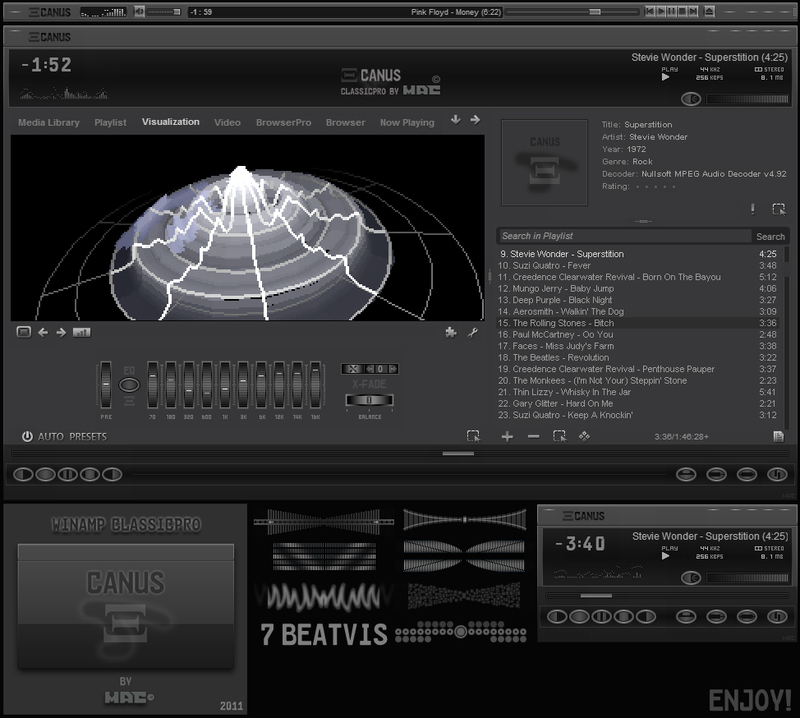 ps: "classicpro 1.15 is cPro - i resolved issue by deleting the skin - then, redownload/install and worked like a charm - not too bad for a few hours of research headaches ... "smiles" ... "
Even though I don't use Winamp or Xion I'll say this ... your graphics are excellent! May have to rethink using one or the other. Thx, man its nice to hear, that. He He, maybe you rethink to use one of. Which player U use?, l made skins fo manny different. please, can some one tell me what visualisation is... where can i get it? ?